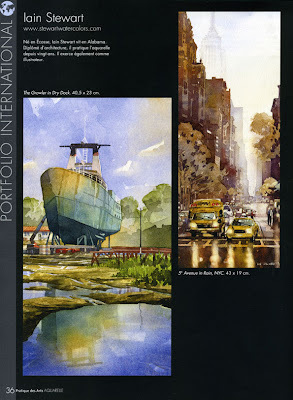 Very exited to get my copy of the french art magazine, Pratique des Art Hors-Serie Aquarell. Check out page 36. This issue is full of fantastic work from watercolor artists around the world and it's a real honor to be included. A special nod to Tom and Tracy who are showcased as well. A hearty congradulation to you! Congratulations!! Your paintings are fabulous and sure, deserve to be published! Hello. I am a Spanish artist. I've seen your watercolors and I look very good. Many technical and sentiment. Your work is very interesting. Congratulations Iain, you certainly deserve the recognition - you're an excellent watercolorist! "The Growler in Dry Dock" is just a terrific painting (one of my favorites)- great colors and composition, it's nice to see it on display! I really enjoy your work.